As apart of the ArtSciLab, I became the Creative Director (or “Chief Disturber” – as Roger called it) of our then fledgling project, Creative Disturbance (CD for short). CD was a niche idea that needed traction, actualization and design thinking. It took us approximately 6 months to get the project off the ground and into a working platform. Here I will discuss the process, my role, and challenges and successes I faced. I’m Creatively Disturbed… Wait, what? Creative Disturbance is an international, multilingual network and podcast platform supporting collaboration among the arts, sciences, and new technologies communities. Wait a minute… are you a network of podcasts or a network of multilingual international artists? Both? Okay so, how do you “create” collaborations? Do you introduce people before they make the podcasts or do they submit anonymously? Is it like a dating service? That’s funny… It’s like intellectual dating. Is that why it’s called “Disturbance”? Because you’re disturbing people? You’re disturbing me right now. I remember our team trying to explain Creative Disturbance to many people in different ways varying from a simple one-sentence answer to a 10 minute story. That first sentence above became the most succinct, comprehensible answer we could muster considering how complex the idea sounded. But, as we experimented with our CD-pitches, (everything was considered experimental in our minds) we all found that short example stories seemed to grab listeners’ attention the best. Storytelling is so powerful. It was also difficult explaining the name. Creative Disturbance. I get “Creative” but why is it a “Disturbance?” Why isn’t it a “nudge” or a “poke?” A disturbance sounds so severe, doesn’t it? It’s mysterious and ambiguous, too. What kind of disturbance do you mean? Like a tsunami kind of disturbance? A nationwide epidemic disturbance? Or maybe just a weird odor emanating from the week-old trash kind of disturbance? Although it has a negative connotation, disturbance just means something is changing or happening. Whether it’s negative or not is a little up-in-the-air. By definition, a disturbance is an interruption of a settled and peaceful condition. This “peaceful condition” is an interesting phrase. But I have another question for you: Should we feel settled all the time? Especially when we are exploring the unknown or conquering new intellectual frontiers? Does a peaceful condition even exist? That’s not what art does. Art usually is accompanied by emotional weight and challenges viewers in various ways. Art upsets. Art unsettles. Art disrupts. In this sense, creating a creative disturbance makes complete sense. One of our biggest hurdles as a team was narrowing down our audience. Who were we trying to reach and why? 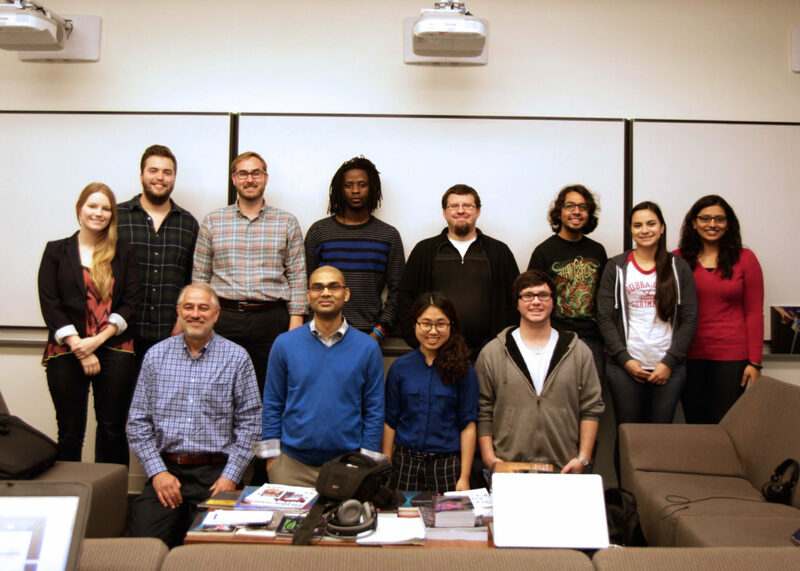 Well, CD started as an extension of a gathering called “the watering hole” at UT Dallas. This was a place where Roger Malina would bring together the intellectually curious and as a result organic discussions would sprout. Admittedly, our espresso machine and snacks acted as the water at times, but the discussions could quench anyone’s thirst for learning. So how do we extend the idea of “the watering hole” into something bigger? Something better? Podcasts are a funny thing. There are extremely well executed podcast channels and ambitious producers doing some incredible storytelling and other creative endeavors, and there are experimental podcasts that don’t quite know what they are yet because the idea of a podcast is still a bit of a mystery in terms of publishing. Although the podcast platform is gaining traction thanks to series like Serial and 99% Invisible, it’s also a less saturated one that draws a certain kind of audience: The people that want to listen to words rather than read or watch. Podcast listeners are an interesting phenomenon by themselves. According to this study, podcast listeners are highly educated, on-the-go, mobile-savvy, and active with social media. They’re multi-taskers! (Sometimes powerful, attentive, and influential multi-taskers.) But creating a large and loyal following is a little bit of a mystery, especially for such a niche idea. It would definitely be an experiment. A podcast can be a versatile pocket of information that can be digitized, shared, produced, and repurposed and listened to by a variety of people doing a variety of things. After researching how our ideal type of audience would be accessing our podcasts and creating our own personas, we started to paint a decent picture of what we wanted and didn’t want our audience to be. We knew we didn’t want scripts or leading interview questions – CD was definitely not doing the interview style – but more like “serendipitous encounters” that led to insightful conversations (which happened to be recorded and produced by us). Brilliant? Or impossible? CD isn’t trying to convince the masses or appeal to an average audience. CD looks for the “right ears.” We wanted to somehow queue-in a tiny percentage of intellectually-curious people who are doing amazing collaborations and cross-disciplinary work around the world without phasing out the potentially curious. We needed to queue-in the right networks. How can we effectively tap into niche communities like sound-data performers, space culture artists, VR pioneers, and female engineers? This was our challenge. Thankfully, Roger Malina (aka #boss) already had large, well-connected networks in the U.S. and France we could start with. What do you do when you are treading on uncharted territory? You learn from those who are doing something similar. We wanted to emulate the professional sound quality of Roman Mars but leave room for experimentation and growth – polished work, but not too perfect. 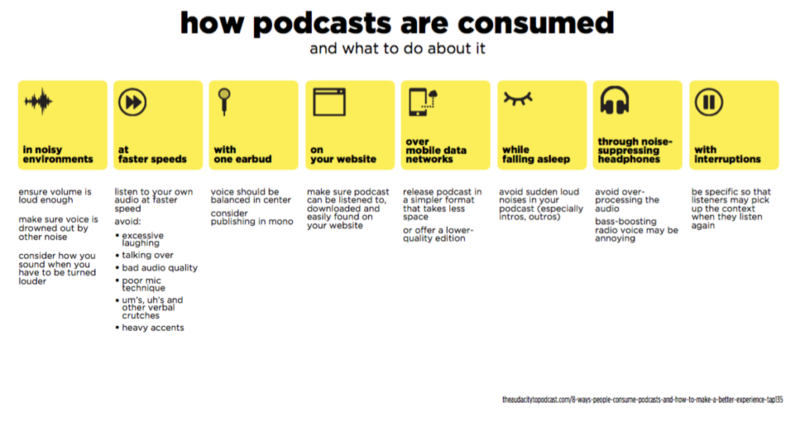 Our team was new to podcast production (some of us are listeners) and so we started researching how to create meaningful dialogue and how podcasts are consumed (see below). People tend to get bored easily if they are not visually stimulated, so with podcasts it’s an entirely different game. You must stimulate and seduce your listeners with sound design and storytelling. However, due to the organic nature of our dialogues, storytelling would be near impossible. What’s the next best thing? Framing? A guarantee of interesting discussion? Mind-blowing sound design? There were a few factors we could control: who’s speaking, what kind of conversations we care about, and the sound design. So that’s what we worked with. We would be publishing curated content that speaks to an international audience with the possibility of intertwining networks. The listeners are the ones who get up and press that little play button every morning. They are our audience, our backbone, our network, our supporters and special ears we’ve been searching for. They are potential voices. Potential producers. They are our growing community and are a pivotal part of the mechanism. The voices are people who are speaking in the podcasts. They are the conversationalists, the collaborators, the leaders in their industries, the opinionated, the informed and the intellectually curious. They are what keep CD in business and keep our listeners listening. They are why we exist; the oxygen. Producers are people committed to or creators of a new channel. The beauty is anyone can become a producer. As long as you have a relevant, non-hateful, interesting topic you’d like to speak about, it’s possible for you to become a producer. Producers are responsible for starting and leading the conversation – so their role is extremely important. They are usually the industry leaders, researchers, or experts and have unparalleled ideas and thoughts to share. If you’re a voice on a podcast but not a producer (one-time kind of thing) then you are a “guest.” Some guests appear in multiple podcasts or channels, and this is encouraged. Being a guest is convenient because you don’t have the responsibility or commitment that a producer has and you can participate freely as often as you’d like. It’s a perfect role for intellectually curious people on-the-go who have some occasional free time. The early stages were mainly filled with brainstorming, clarifying, categorizing, and trial-and-error process tests. 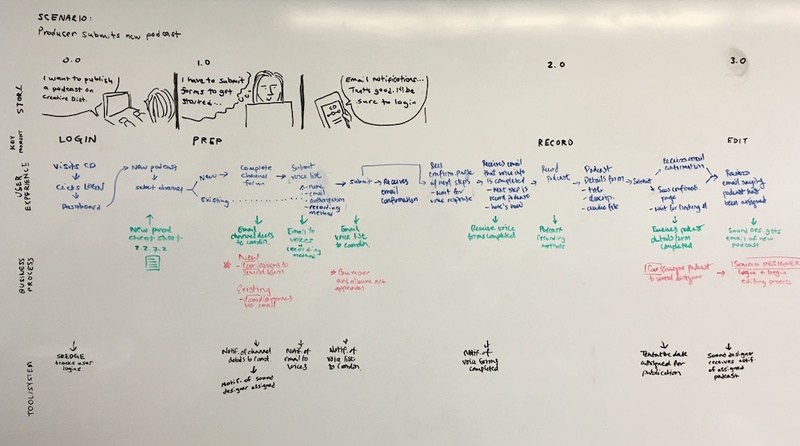 There would be times where sticky-notes would be plastered on all four walls with process and thinking maps and our team members would overdose on espresso because we had yet another major process change. This became an everlasting battle, as our podcast production and distribution processes were a lot more complicated than any of us could have anticipated. Honestly, even now the process is still changing and improving. I think this is natural, though. In order to improve a process, it must always be evolving and adapting to new technologies and audience desires. As you can see the process map that Cassini originally made (above) for our sound design team is complex, gorgeous and organized. It’s a very unsurprising story how we ended up with the much simpler and wordy version below. It turned out that our team responded better to simpler, more exact details and specifications in the production process. Our sound design team members were also not visual designers like Cassini and myself. If I remember correctly, the original process map ended up creating more questions and confusion than providing clarity. 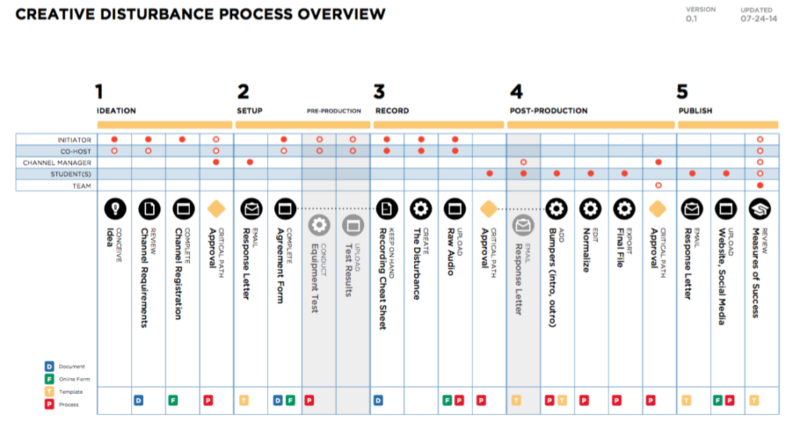 The process map below was easily editable (in Google docs) for when changes in the process happened, easy to read and understand, easily printable (for checklist usage), and created collaboratively with the sound team – the people who would be using it the most. It doesn’t look as pretty, but it is way more functional. This, ladies and gentlemen, is how you prep, edit, and publish a podcast onto a website platform semi-seamlessly. 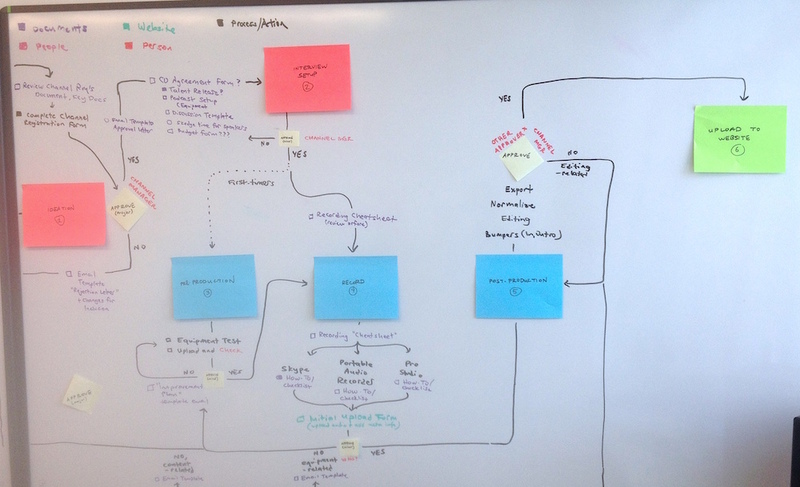 This is our more finalized process map after many, many iterations and team walkthroughs. 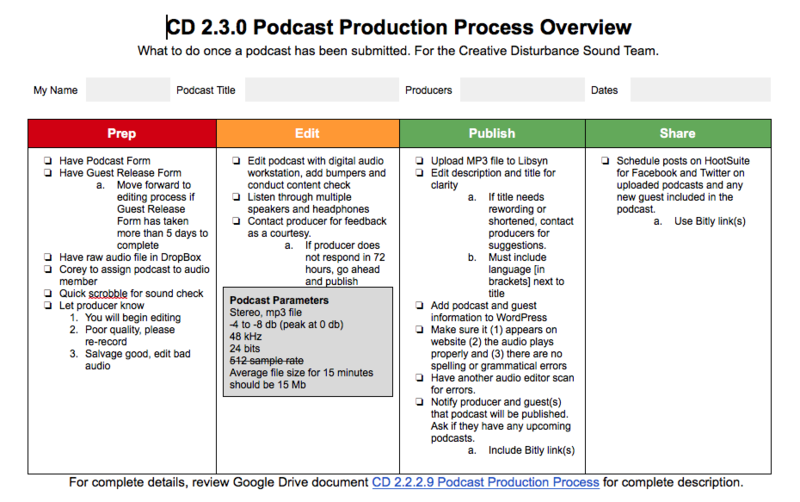 It functioned like a checklist for our sound design team as our supply of incoming podcasts increased. This would help keep our content quality consistent as well as allow our team to spot process errors, track our production quantity and track other metrics we were interested in, like diversity, geography, topic, etc. It also helped with user-end feedback with our audience. The design team would always stay connected with the producers on the other side of production which enabled a transparent experience throughout the process.